Our Ecology Group volunteers have created a new nature and history trail through the woodland south of Nunckley Hill. The path is a circular half mile long route that is accessed via a foot-crossing next to Nunckley Hill station platform. For disabled visitors who can’t traverse the steep path from the station platform, access is available via Swithland Lane. Please see staff in the Granite’s coffee shop who will be able to give you access. We regret that only assistance dogs are allowed on the trail. All of the work to create the trail has been done by our ecology group which primarily consists of young people and their parents, plus a small group of volunteers with learning difficulties from a local college who help on Tuesdays. Some of those who attend our Wildlife Warrior sessions have also helped to create the trail. Much thought has gone into creating the path which takes in many areas of ecological and historical interest. These include differing types of woodland habitats and the Wildlife Warrior activity areas, as well as the ruins of the old Dobb Hall and the industrial archaeology of the old Nunckley Hill quarry. We feel the path is accessible, with care, for disabled users. The path has touch boards along both sides to aid the partially sighted and is suitable for wheelchair or mobility scooter users. We strongly recommend that wheelchair users have an assistant to help them with this surface. Information boards, designed by our volunteers, have been erected along the route and include Braille and written text on each sign. We are deeply grateful to Loughborough University, Loughborough Round Table, the Leicestershire & Rutland Wildlife Trust, Aggregate Industries and Sainsbury’s who have sponsored the cost of having the boards made. 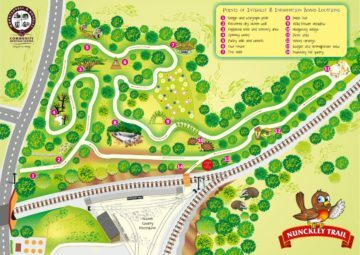 Part of the trail runs alongside the restored railway and there is a picnic/viewing area where you can watch the trains go by. The wild flower meadow, funded by Leicestershire County Council’s Stepping Stones Project and planted by local school children in October 2013, has been a resounding success. The first year wildflowers have been fabulous and the insect life they have encouraged has been clear to see. We look forward to the meadow looking even more colourful next summer. Pictures thanks to Mark Ramsell. If you intend to visit the trail with the family then why not download our Spotting Guides which may help you indentify flowers and birds you might see on the trail. Want to know more about wildflowers? Then why not take part in the Great British Wildflower Hunt; details can be found at https://www.plantlife.org.uk/wildflowerhunt/. You can also download their wildflower spotting sheets. If you would like to volunteer and help maintain the trail then download our Trail volunteer leaflet for further information. Why not take a “virtual” tour to get an idea of what awaits!